This tutorial covers all you need to know about using Quicken savings goals. Savings goals represent money held in regular accounts that is set aside for a specific purpose, like a vacation or a new flat screen TV. Money transferred into a savings goal remains in the original account but is hidden so you do not spend it until you want to. You can tell Quicken to show the hidden savings transfer in an account at any time. In addition to hiding savings goal amounts in account registers, Quicken creates an asset account for each savings goal. You can see these asset accounts in the property and debt center and on the account bar. Because the money allocated to a savings goal doesn't really leave the funding account, neither the account balance or the ability to reconcile accounts is effected. When you set up a savings goal, name it something that makes sense to you, like Summer Vacation or New Car. Before you set up a savings goal, look over your category list because you can't give a savings goal the same name as a category. When you set up a goal, you need to know the total amount you need to save to meet your personal savings goals and the target date by which you want to have saved the total amount. In Quicken, click on Planning on the top tool bar. Click on Savings Goals, then click on New in the upper left corner of the pop-up window. Enter a name for the savings goal and the total amount you want to save. Enter the finish date, which is the due date for having reached your goal. If you have multiple currencies enabled in Quicken, you will see the option for choosing a currency for the savings goal. Click on OK to finalize the savings goal. You will now see your savings goal along with the monthly projected contribution at the very bottom of the Quicken Savings Goals window. If you set up multiple savings goals, you will see the projected contribution change depending on which savings goal you click on. The monthly projected contribution is what you need to save each month to reach your goal, but you can contribute more or less. To fund a Quicken savings goal, you need to make a contribution to the goal. Remember that the "undo delete" feature in Quicken will not work with transactions in savings goals, so if you accidentally remove a contribution, you will have to re-enter it to get it back. Contributing to a savings goal does not affect your net worth amount in Quicken. Click on Planning on the top tool bar. Click on Savings Goals, then click on Contribute in the upper left corner of the pop-up window. Select the account from which to transfer funds to the savings goal. The money will not actually be removed from the account, it will simply be hidden until you need to retrieve the funds. Enter the date of the contribution to the savings goal and the amount to contribute. Quicken defaults the contribution amount to the monthly projected contribution amount, you can accept this or enter another amount. The balance of the account(s) used for savings goals contributions will be artificially reduced by the amount of the contribution to prevent you from spending the money that has been set aside. The money is still in the account and you can view the true account balance at any time. Contributions to a savings goal can be made from more than one account. If you use multiple accounts to fund a savings goal, each account balance will be reduced by the amount contributed by the respective account. For example, if you contribute $10 from your checking account and $25 from your savings account to a savings goal, the checking account balance will be $10 less than the actual balance and the savings account balance will be $25 lower than the actual balance. Quicken reduces balance of an account used for savings goal contributions. Those funds are still in the account, they are just hidden so you do not accidentally spend the money you are saving. Go to the Quicken account register used to contribute to savings goal. Click on View on the upper right toolbar. Remove the check next to Hide Savings Goals by clicking on it. Now you can see the actual account balance, and you will see transactions in the account with a payee called Contribution Towards Goal. The savings goal is found in the category field for these transactions. To avoid spending money dedicated to savings goals, turn on the Hide Savings Goals option by following this procedure again to place a check mark next to Hide Savings Goals. Another useful feature in Quicken is hidden accounts. When you withdraw funds from a savings goal you are actually transferring the money from the savings goal to back into the account the contribution was made from. You cannot spend directly from savings goals, and if you try to, Quicken will not record the transaction. Click on Savings Goals, then click on Withdraw in to top tool bar. If you have used one account to fund the savings goal, Quicken automatically selects that account to return the savings goal funds to. If you used multiple accounts to fund a savings goal, you need to choose the account to return funds to (see note on multiple accounts below). If you try to withdraw more from a savings goal than you have contributed from an account, Quicken will tell you that you have not saved enough money for the transfer. You then have to click OK and only withdraw as much as was contributed from that account. If you used multiple accounts for savings goal contributions, you can only withdraw from each account the amount that was contributed for the account. Quicken tells you how much has been allocated to the savings goal from an account when you select the account to put funds back into during a savings goal withdrawal. You can also see how much you have contributed to a savings goal from each account by running a savings goal register report. You can see progress made toward savings goals on the progress bar for each goal. Go to the savings goals in Quicken (click on Planning, Savings Goals) and click on the savings goal you want to see a progress report for. The progress for the selected savings goal is reported in the bar graph at the bottom of the page along with the total currently held in the savings goal. The bar is green if you are meeting or exceeding contributions to the savings goal, or yellow if you are falling behind on contributions. For convenience, you can add the savings goals you reference most often to your Quicken Home Page. From the Quicken Home page, click Customize on the upper right. Click on Customize this View to add a savings goal progress bar to the existing view, or Create New View to add a progress bar to its own view. Under Available Items, scroll down to Planning, then click on Savings Goal Progress. Click Add to include one savings goal progress bar to the view. 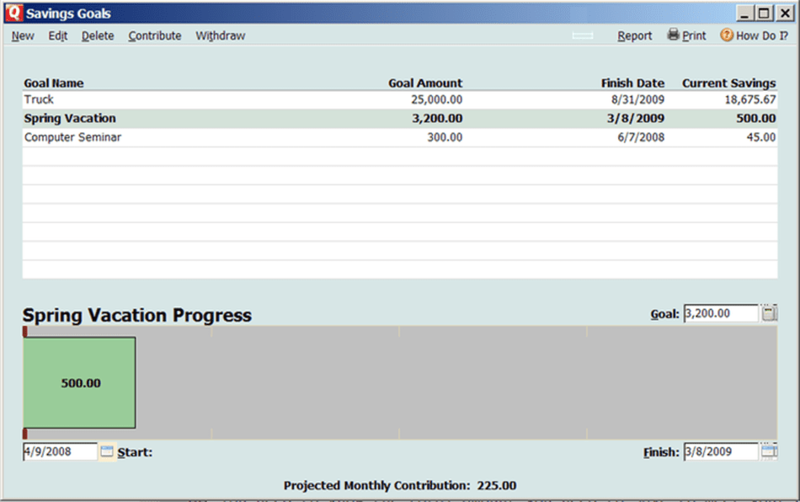 To show multiple savings goal progress bars in a Quicken view, click on Savings Goal Progress and Add again for each goal. Click OK when you have finished adding savings goal progress bars. At first you will see the progress bars in the Quicken Home Page view with each bar defaulting to the first goal you have listed in your savings goal. To change each progress bar to a different savings goal, click on Options on the upper right of the savings goal progress bar. Click on Customize this graph, then select the savings goal you want to see a progess bar for, then click on OK.
To see contributions and withdrawal from a savings goal, run a register report. If you are not already in the savings goals list, click on Planning on the top tool bar in Quicken. Click on Savings Goals, then click on the savings goal you want to see a report for. Click on Report in the upper right tool bar. You will see a register report with contributions and withdrawals for the savings goal by date with total inflows, total outflows and the net total (inflows less outflows). In savings goals reports, Quicken sees the accounts used for contributions to and withdrawals from the savings goals as categories. See 'Subtotal by' at the top of the report window. The box next to Subtotal will probably say Don't Subtotal. Click on the arrow head on the right of that box and click on Category. The savings goal register report is now subtotaled by the accounts used for contributions and withdrawals. The subtotal is straight across to the right of the account under Transfers, with an overall total at the bottom of the report. The only aspects of a savings goal that can be changed are the finish date and the amount of the goal. Click on Savings Goals, then click on the savings goal you want to edit. Click on Edit on the upper left. Change the amount or finish date, then click OK to save your changes. Deleting a savings goal in Quicken automatically returns all funds contributed to the savings goal to the accounts the funds were contributed from. Click on Savings Goals, then click on the savings goal you want to delete. Click on Delete on the upper left of the savings goal window. Quicken asks if you want to keep the asset account for your records. Click on Yes to delete the goal, but keep asset account. This results in the savings goal being deleted from the savings goal list, but the asset account is retained with a zero balance. Keeping the asset account is useful if you want to see the activity for this savings goals in reports. Click No to delete both the savings goal and the account. All funds withdrawn or contributed to the savings goal are returned to the originating account. To verify, select an account used with the deleted savings goal and set the option to view hidden savings goal transfers if it is not already set for the account.